In today’s SUV market there are a lot of vehicle options out there that claim they are “off-road worthy”, but all of us here at Allan Nott can tell the difference between pretenders and the real deal. Over the years Toyota has produced some pretty impressive vehicles that are more than capable of venturing off the beaten path and taking you to places you never thought were possible, however, the 2014 Toyota FJ Cruiser in Lima, Oh might just be the epitome of what off-road ability really stands for. Right out of the box, the FJ Cruiser comes standard with equipment most would only find in an off-road catalog. Even though the long list of terrain-taming features are impressive on this unique SUV, the most special thing about the FJ Cruiser is that Toyota has found a way to make it a great everyday driver as well providing impressive fuel economy and ride quality. Now that we have it in stock, it's your turn to try out the 2014 Toyota FJ Cruiser in Lima, Oh in person. Schedule a test drive today and experience the difference. Interested in a 2014 Toyota FJ Cruiser? It all starts with the 2014 Toyota FJ Cruiser in Lima, OH V-6 engine. Outputting 260 horsepower and 271 lb-ft of torque, the FJ Cruiser gets the job done by allowing the SUV to respond and stay controlled ranging across the entire RPM spectrum.Choices of either a five-speed automatic or six speed manual transmissions are available on the FJ depending on any driver’s preferences. Supporting the engine and transmission performance is a serious four-wheel drive system that offers choices of either part-time or full-time systems to crawl over rocky terrain, navigate steep inclines and declines and trek through deep mud and snow. All said and done, the 2014 FJ Cruiser can drive through water depths of up to 28-inches, manage extreme departure angles and even get it out of the hairiest of situations thanks to a built in jack. 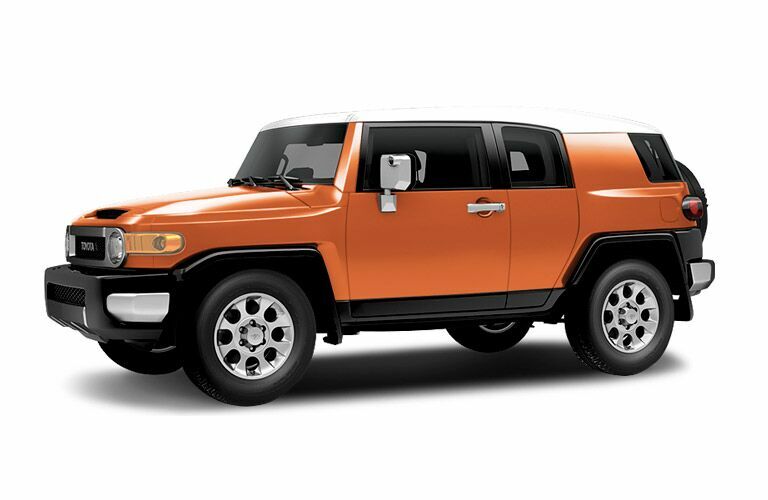 The 2014 Toyota FJ Cruiser in Lima, Oh also offers incredible driving peace of mind. It’s built with a true “frame-on-body” construction for maximum rigidness and also features a tough undercarriage to protect against protruding rocks and roots that may be littered on your intended path of travel. In addition, the FJ comes standard with six airbags, a tire pressure monitoring system, side impact door beams, LATCH system for smaller passengers and Toyota’s Star Safety System™. The Star Safety System™ includes a suite of six advanced safety features that includes Vehicle Stability Control (VSC) , Active Traction Control (A-TRAC), Multi-terrain 4-wheel Anti-lock Brake Systems (ABS), Electronic Brake-force Distribution (EBD), Brake Assist (BA) and Smart Stop Technology® (SST).